i took the photo of today's featured tattoo quite a few months ago, I can't recall the name of the woman whose arm it is on - i her met at a community festival in town - i was walking and she was on a bike, so i assume she lives nearby. i recognized the script as sanskrit and said as much, this recognition pleased her much. along with the sanskrit script, i was drawn toward the rendering of the heron (egret) - they are such mighty great birds and if we consider animal spirit guides, herons remind us to work toward achieving balance and to live in both the physical and spiritual world. the script spells ahimsa - a term which means to do no harm - literally the avoidance of violence. ahimsa is a basic tenet of hinduism, jainism and buddhism and in essence means practicing kindness and non-violence to all sentient beings. a good lesson and something to strive toward. australian singer-songwriter and folk icon judy small singing one voice in the crowd. geez, it has been a long time since i thought of or listened to judy small, although back in the day (of cassettes) i listened to her lots - all i can say is thank goodness for youtube and the internet - they can make old songs new again! So be your one brick in the wall, be one voice in the crowd. I've never heard of Judy Small. She's terrific. What a voice. Have to learn more about her. She's right about "one voice in the crowd". 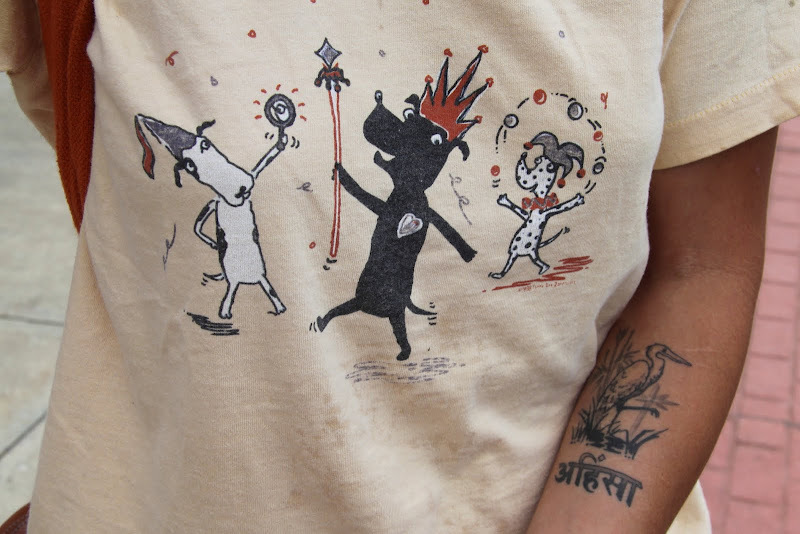 I love both the shirt and the tatoos! We might all benefit from having the heron and "ahimsa" tatooed on our hearts and eyelids. Just listened to the video and love it! Also some of the others on your tube! Thanks for introducing me to Judy Small. Beautiful tattoo, and a great t-shirt, too!